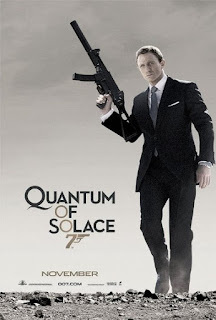 When Quantum Of Solace was first released, myself and a friend (Ron Brunwin) were writing a 007 stage spoof which would premiere not long afterwards. We wanted a few topical and up-to-date gags about the film to include at the end of the play. So, we went to watch it, with my wife. The three of us. Ron and I with notepad and pens. My wife with the opinion that Casino Royale was a damned fine movie and not just because Daniel Craig looked fit in his swimming trunks. My wife fell asleep halfway through. So, what’s so bad about the sequel to Casino Royale, when the introduction of Daniel Craig seemed to silence all the naysayers and critics who had scoffed at his casting and at the decision to reboot the franchise? Well, it seems that the Writer’s Strike, which affected Hollywood around the time the movie was about to go into production, meant that the film began without a finished script in place. That’s the official line in interviews nowadays about its failure to engage and satisfy an audience hungry for more 007. How true that is, is up for debate. A multi-million pound film going into production without a fully-formed script, when the locations and actors and sets have all been approved beforehand, seems a tad unlikely. Especially as the producers, Michael G. Wilson and Barbara Broccoli, are very hands-on and don’t seem to mind how much of a gap there is between movies as long as the movie is right. Again, I’m sure some of the blame falls on the main writers, Neal Purvis and Robert Wade. They have proved time and time again that they need better writers to polish their scripts. As the old saying goes, you can polish a turd to shine like a diamond but it’s still a turd. However, a lot of the blame falls on Marc Foster, who directs the movie as if it’s an unofficial entry into the Jason Bourne universe (as portrayed by Matt Damon). Bond, in this movie, is nothing more than a man out to get revenge and that means Daniel Craig eschews dialogue for lots of blank, emotionless looks into the middle-distance, as well as dumping a dying friend in a rubbish bin. I’m sure all of this was supposed to convey inner torment, emotional upheaval, and rugged lonesome mystery but it just makes Daniel Craig look like (a) he wishes he had told his Agent to turn down a sequel, (b) he is seriously constipated and very angry about it, and (c) that his desire to be compared to Steve McQueen lacks the necessary warmth, charm and screen presence to even be a shadow of the cinematic icon. The best thing going for the film is the continued adherence to a deliberately retro look and feel, like it is an expensive homage to the early Sean Connery era of Bond. This was there in Casino Royale, it’s amplified in Quantum of Solace. Quantum of Solace has Dennis Gassner to thank for the stylish look and he does an amazing job of creating the world in which Bond goes about his personal mission of retribution for the death of Vesper Lynd (his love from the previous film). It also seems to share a lot of elements with Licence To Kill, in fact; which had Timothy Dalton as Bond, ‘doing’ Fleming’s Bond long before Daniel Craig had been championed as such. Quantum Of Solace starts off with a frantic car chase, which has all the shaky camera-work and fast-paced cutting of the Bourne films. It’s muddled and lacks any real excitement. The fact that Bond isn’t hit by at least one of the machine gun bullets is nothing short of a miracle and he ends the chase by picking up his own machine gun and killing the chasing car’s driver with one short burst. I’m not suggesting that Bond should be based in reality but Casino Royale had tried to go for a more serious tone and this car chase is beyond silly. The shadowy organisation behind the villain in Casino Royale, and creating a through line of a plot device in Quantum Of Solace, are a very pale imitation of SPECTRE (from the Connery era). They objectives and motives seem muddled and small-fry, even though they are supposed to be the most amazing ‘undercover’ operation. It seems they like buying up oil fields in order to control the world’s economy. After the disappointment of this film, they appear to have put Quantum to bed in order to allow Skyfall to have a decent villain for Bond to battle. That seems to be a real problem with Quantum Of Solace, in that the central villain of the piece – Dominic Greene (as played by Mathieu Amalric) – is somewhat of a wet lettuce. There is a speed and pace to the movie, though, with many chase scenes that are all adrenaline-filled and – all in all - everything rattles along at an amazing speed. But, it’s such a muddy story that it’s difficult to know how Bond ever gets anywhere (especially as he just kills everyone he comes across, rather than questioning them). Daniel Craig, whilst not the best actor in the world (he pouts more than Pierce Brosnan, which I didn’t think it was possible to do, and delivers lines too quickly and too off-hand), brings a brute physicality to the role, as well as his desire to be a silent statuesque loner, which showcases his considerable ability to be running, jumping and standing still as 007. He still doesn’t convince when he tries to be suave but as a thuggish assassin he more than does his job (though he does appear to be basing his portrayal on the T-1000, played by Robert Partrick in Terminator 2: Judgement Day). For the first time since David Hedison (who portrayed his version nearly 20 years apart), Felix Leiter is played by the same actor – Jeffrey Wright – but it's a pity that it was not continued in Skyfall. He has more to do in this film than previously and is turning into quite an interesting version of the character. The Bond girls are a trio of strong portrayals in a movie where not many characters stand-out. Firstly, there’s Dame Judi Dench (she’s allowed to be a Bond girl, right?) as M. She’s consistently fantastic with whatever dialogue and whatever situation she’s put in, as you would expect, but – for someone who appears so impish and jolly in real life – she’s incredibly good at playing the hard-nosed, barb-spouting, sarcastic ball-breaker. Secondly, there’s Olyga Kurylenko as Bolivian secret agent Camille Montes, who is on her own personal mission of revenge too. Her and 007 spar well together and seem to be the flipside of each other’s characters. It’s rather annoying that, when she gets her revenge, she then reverts to a ‘damsel in distress’ and needs to be rescued by Bond; due to her childhood trauma returning to haunt her. Finally, there’s the inexperienced ‘agent’ Strawberry Fields (though her first name isn’t uttered in the movie), who turns out to just be a Filing Clerk from Head Office who obviously grabs the opportunity to see what a real MI6 agent gets up to on his day off. She’s played with an air of gung-ho English, jolly-hockey-sticks type characterisation by Gemma Arterton. The roles is refreshingly upbeat in a very downbeat movie (even though she meets a sticky end) and obviously stands out because of this, though the ease with which she falls for the ‘charms’ of 007 and hops into bed with him, is somewhat of a rushed storyline. As much as Daniel Craig has the body that men aspire to and that women expire over, he’s not the sort of character you expect women to fall in love with the instance they meet him (unlike a few of the Bonds before him).